This is a Isekai/Time Travel story about Mei, whom after a birthday party of when she was young, was labeled a freak when she could see ghosts/spirits. Because of this she has no friends, and people talk behind her back. During a magic trick in public, she goes back into time and begins to meet the various men of whom will interact with Mei during this run. This is an interesting start, and I think it will be a series that helps rebuild Mei from a lonely girl, insecure about her abilities, into someone that is confident, and doesn't feel alone. Not to mention that each of the men has a specific trope to them, all handsome in their own ways. It will be interesting to watch this series play out. This is a reverse harem anime. It's the story of a girl that sees and talks to ghosts. She is teleported to a place where men are impeccably dressed and very attentive. It's the story of a girl that sees and talks to ghosts. She is teleported to a place where the men are impeccably dressed and everyone is interested in her. Voice acting is ok. and the art is OK. I don't have much interest in such shows, although I'm sure the women are. It's OK for what it is. 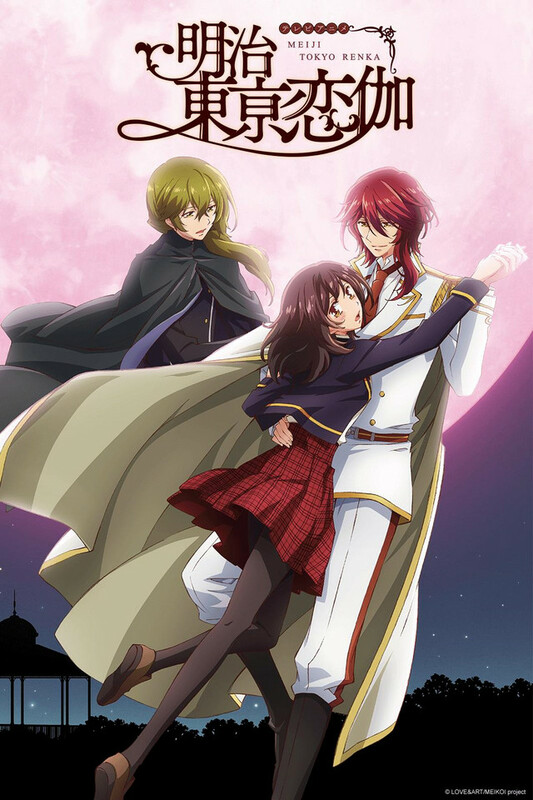 I am on episode one and so far, Meiji Tokyo Renka has a very interesting plot. I also love the art, everything is beautifully designed. The main character has an interesting backstory. I also love all of the characters introduced in the first episode! I can't wait for the next episode to come out! First thing I have to say is that the opening and ending music is by far the best I've heard so far this season. (Winter 2019) Different than the music you usually get in an anime. Yep...love the music. And I'm intrigued by the characters. I'm not generally a big fan of period pieces (Historical dramas?) and the plot is only mildly interesting...but I do enjoy the fact that the story is populated by characters that are pulled straight out of Japan's history. Authors, artists, and such. I've already found myself researching some of the names...and becoming just a bit more educated when it comes to learning and understanding Japan's history and culture, especially where it concerns the 'arts'. (The real Mori Ougai was a fascinating man.) Give this one a try. You might find yourself surprised by how much you like it. Upon first appearance, the show lives up to its isekai format. But it is obviously clear that by the middle of the first episode that Mei would most likely be a damsel in distress more than anything else. This is not to say that there aren't any good parts to this anime. For instance, the opening song has a great beat to it, but it was treated as a showcase to show all the boys this damsel will be attracting. And Mei's younger birthday party was cute. But other than that, I could not find myself interested in this one. All in all, this is not my cup of tea. If it is your cup of tea, please enjoy. Since this is clearly a reverse harem, it's rather hard to "give all the men a chance to be with her" and I get that there's usually one "canon" character the female protagonist ends up with and of course it has to be Mori. Now I've watched Bungou Stray Dogs and seeing some author's names pop up in this anime, the big one being Mori, I can't really like him due to his other counterpart in Bungou Stray Dogs. Also he straight up claims Mei to be his fiancee and honestly I really don't like that? But then again her going along with it is very typical for a female pro-tag to do. It's still on going and I hope that this anime focuses more on the "ghost hunting" (sorry I forgot the term they called it) aspect rather than her being his fiancee and her trying to be that role. I really enjoyed this anime from the first episode. The synopsis at first didn't intrigue me, but after a while I decided to just go for it and I'm glad I did. The first anime that came to mind when I saw the first episode was Ouran High School Host club because of all the male characters introduced within a short time span. It also has a lot of Kakuriyo Bed and Breakfasts vibe - a female character spirited away, if you will, and is able to see spirits. She's certainly less resistant than Aoi, however, and she's very capable like Haruhi. So far this has been a very entertaining watch, showing fairly realistically what it might feel like to travel back in time, while also being intentionally outlandish and witty. Definitely worth watching with layers of intrigue woven throughout the show. Very cute series and fun to watch! This is a really fun and cute anime! Its meant to be humorous and light hearted, which is great when I don't feel like watching something with a deep, complex story line. Plus all the characters are super cute! I've been hooked so far and hope they continue to make many more episodes. Maybe this is just me, but I don't understand the appeal of turning old men historical figures into same-faced anime hot-boys. I just don't get it. I feel like, as a community, we can do better. I feel like, we can do something else idk. This is why normal people make fun of the anime community.